Canada is a great place to travel abroad and is conveniently located within just a short distance from the northernmost regions of the United States. This country offers breathtaking panoramic views of its natural landscape, as well as, cosmopolitan cities tailored to the most discerning metropolitan traveler. Explore the Canadian side of Niagara Falls, Thousand Islands, Lake Louise and more. City tours are also available in Montreal, Ottawa, Toronto and Vancouver. Why wait? Book a Canada Tour today. Provide you with a complete tour experience of our Nation’s Capital from all avenues, Ottawa River Cruise or Rideau Canal Cruise. 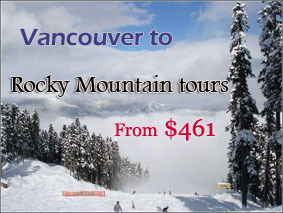 Visit Vancouver, Kelowna, Okanagan, Winery, Salmon Arm, Gondola, Sulphur Mtn Hot springs, Banff, Lake Louise, Kamloops, Ginseng Factory and more.